ACEC-SC hosted the Engineering Excellence Gala on February 6, 2018 at the Columbia Museum of Art. ICE was recognized for Engineering Excellence in the “Small Project, $500,000 – $2 Million” category for the Botanical Parkway Culvert Replacement Project in Lexington County, SC. 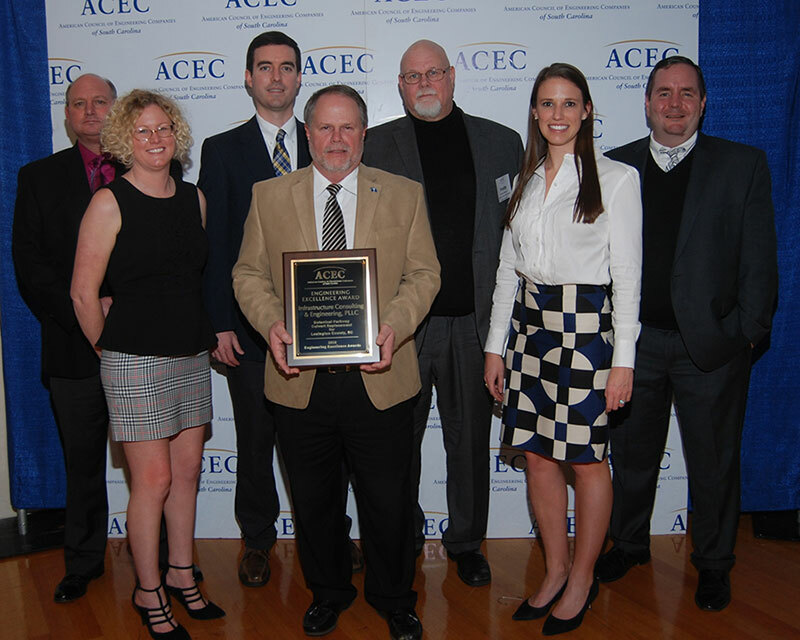 Additionally, ICE was recognized as an ACEC Finalist and received an Engineering Excellence Award in the category of “Structural Systems, $2 Million – $10 Million” for the Emergency Bridge Package 4 project that included the replacement of four bridges damaged by floods (owned by SCDOT). Botanical Parkway Bridge Replacement Project – Lexington County, SC | On Oct. 4, 2015, during a historic flood event, a 6-foot corrugated metal culvert installed under Botanical Parkway in Lexington County collapsed from the strong waters of Double Branch Creek and was washed downstream making the roadway impassible. This quickly became a topic of local interest as Botanical Parkway is the primary route for accessing the Botanical Gardens and Riverbanks Zoo which boasts more than a million visitors a year. As the primary design firm, Infrastructure Consulting & Engineering, PLLC provided designs for the culvert structure, drainage and roadway approaches, and conducted inspection services. The site was completely re-engineered so the culvert is more substantial, should a flood threaten it again. The road was re-built from the bottom up and included a concrete structure underneath to make it more secure than it was prior to the flood. Adequate guardrail was added to protect vehicular traffic from the culvert drop offs. The project was designed, constructed and opened to traffic on November 6, 2015, one week ahead of schedule. US 176 Emergency Bridge Replacement over Cannons Creek – Newberry County, SC | The October 2015 historic flood event caused flash flooding across much of South Carolina. The flood waters damaged many of the areas roads and bridges causing significant traffic disruptions. Four bridges were included in this project package and consisted of Pine Grove Road over Twenty-Five Mile Creek in Kershaw County, Congress Road over Jumping Run Creek in Richland County, Rockbridge Road over Spring Lake in Richland County, and Battery Park Road over Black Mingo Creek in Williamsburg County. Infrastructure Consulting & Engineering, PLLC (ICE) served SCDOT as the Lead Design Consultant on the Design-Build team and provided project management, bridge, roadway and drainage designs, and coordination of utilities, FEMA fees and permitting. The flood damage to these four bridges caused closures to the traveling public resulting in lengthy detours. Efficient coordination and effective communication between all team members including the engineers, contractors, subcontractors, and SCDOT was imperative to quickly provide the services necessary to replace these bridges without sacrificing quality, safety and impacts to the environment and avoiding unnecessary delays.